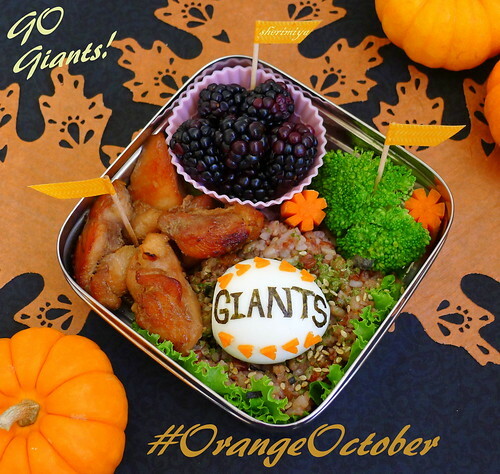 Happy Little Bento: SF Giants World Series 2012 Champions EcoLunchbox Bento! 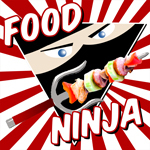 SF Giants World Series 2012 Champions EcoLunchbox Bento! SF Giants World Series 2012 Champions EcoLunchbox Bento, a photo by sherimiya ♥ on Flickr. Did you watch it? Even if you weren't a San Francisco Giants fan before, it's hard not to admire these guys for the fantastic effort they made in this series, where they swept the Detroit Tigers in 4 games. It was very exciting. [They won two years ago, too, and I made a bento then too (here).] I made a little celebratory bento for TinySprite: mixed red rice sprinkled with furikake, with shoyu chicken, and a boiled egg GIANTS baseball, steamed broccoli, carrots, and a little silicone cup of blackberries. The team colors are orange and black, which is very fitting for this time of year, isnt' it? The most tedious part of this bento was the nori letters, by FAR. This is why I rarely cut nori; I have little patience for it, and the pieces (letters) all end up different sizes. But you get the picture! Yay for the home team! Packed in my super cool EcoLunchboxes Solo Cube. Do you like it? Check out my giveaway in this post here: you can enter for a chance to win an EcoLunchboxes Solo Cube (plus an ECODipper) of your very own, just by sharing your green ideas with us all. I'm loving all the awesome ways you are all making an effort to go green! I missed watching the series, but I'm lovin this lunch! It looks super delicious! Three cheers for Sherri; the hand cut lettering ROCKS! Yay Giants!! I have to admit, I didn't watch any of the games, lol. I'm not much of a baseball fan... but I'm a huge fan of this bento! I love your mixed rice!